A man seen harassing a woman in a Cook County forest preserve has now been charged with a hate crime as viral video makes headlines nationwide. The man seen in a viral video verbally attacking a woman for wearing a Puerto Rico shirt was charged Thursday with a felony hate crime. Timothy Trybus was original charged with misdemeanor assault and misdemeanour disorderly conduct. Those charges were upgraded to two counts of felony hate crime after the Cook County State’s Attorney’s Office reviewed the case. Trybus was re-arrested Thursday and is scheduled to appear in bond court Friday. The Cook County Forest Preserve officer seen standing by while Trybus berates the woman in the video has resigned, officials said Wednesday evening. 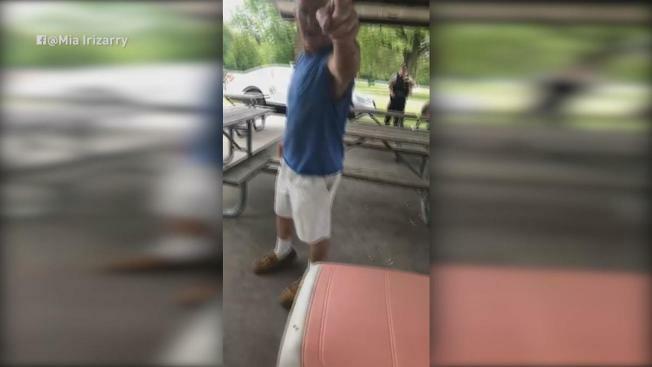 The Cook County Forest Preserve police officer is under investigation after video appeared to show him ignoring a woman’s pleas for help as a man berated her for wearing a Puerto Rico shirt last month during a birthday party at an area park, according to the Forest Preserves. The man seen in viral video of the encounter has been charged with assault, authorities said. Cook County Commissioner Jesus "Chuy" Garcia released a statement shortly after the announcement calling the officer's resignation a "commonsense decision." He called for more oversight in the training of forest preserve officers. "I am committed to exploring how Cook County can better address racial and social equity to ensure that all people in Cook County can feel safe and welcomed while receiving our services and utilizing our grounds and facilities," the statement reads. "I will be closely monitoring the developments of the ongoing investigation and will work to guarantee that potential hate crimes in Cook County are fully prosecuted." The video shows the woman asking a nearby Forest Preserves officer for help, but the officer does not appear to stop the man, who continues his rant and gets increasingly closer to Irizarry in the space she said she had rented that afternoon. The officer then turns around and walks back toward his car. “Why is she wearing that sh--?” the man shouts. Trybus questions if Irizarry is a citizen of the U.S. and continues to shout at her as she pleads with the officer to remove the man from the space, footage shows. Eventually, other park guests arrive at the scene and get involved. The officer then says something to Trybus, who continues to argue with those at the park as the officer stands by him. Other officers arrive several minutes later and one eventually takes down Irizarry’s information and her account of what happened. Trybus, who authorities said was intoxicated, was arrested and charged with assault and disorderly conduct, the forest preserve said. Though the footage had already been seen over a million times after it was first posted in early June, new postings of the video have prompted responses from the forest preserve and even the governor of Puerto Rico. Forest Preserves officials said the officer involved in the incident has been with the department for 10 years, and did call for assistance on his radio. Still, they stated the officer's actions were not part of procedure. Officials said an investigation remained ongoing as of Tuesday and the officer involved was assigned to desk duty pending the outcome. They noted that they apologized to Irizarry and refunded her money. Preckwinkle said she apologizes to the woman, calling the man in the footage "abusive and offensive." She said in a statement she spoke with Rosselló, expressing regret over the incident and assuring him it "does not represent our values in Cook County." "I assured him that disciplinary action regarding the Forest Preserves police officer will be taken upon conclusion of our investigation," she said in a statement. The video prompted responses from numerous area officials. Rep. Luis Gutierrez took to Twitter after the footage made headlines, calling for a need to "stand up to bigotry & bullies." "There's a culture of bigotry & hate that's been condoned in US, which now feels unleashed to express itself in the most ugly & aggressive ways," he wrote. "In this case, a US citizen questions the citizenship of another US citizen and American law-enforcement just sits back and watches. I don’t care that she is Puerto Rican or wearing a Puerto Rican flag t-shirt just because I'm Puerto Rican. We all should care because we are decent human beings & need to stand up to bigotry & bullies..."
In a press conference Tuesday afternoon, Cook County Commissioner Luis Arroyo called for the officer to be fired. "I have full faith in our system, in the process and the investigation that is underway. But me, personally, I believe that this officer did not do his duty and I will not accept anything else but this officer’s termination," he said.